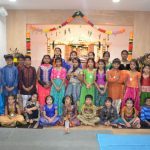 A unique 2-day workshop for youth aged 9 to 15 years was conducted by G.O.D. Houston on March 12 and 13, 2012, in the presence of Sri Poornimaji, disciple of HH Sri Sri Muralidhara Swamiji. This program focused on exposing the participants to the modern contributions of ancient Indian scriptures and civilization. Based on some of the subjects covered during the 10-day “Traditional Treasures” program conducted in Chennai by G.O.D. India Trust in January 2012, this workshop presented the seemingly heavy subjects in a child-friendly, interactive and interesting manner. 1. “Pioneering Science and Technology” — Scientific contributions of ancient Indians and modern scientific references in the Vedas and other ancient scriptures. 2. 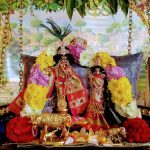 Past Life & Rebirth: Myth or Truth — Explanation of rebirth as set forth in Indian scriptures and findings from recent western scientific research in the field. 3. “Ancient” Modern Medicine & Secrets of Medicinal Plants — Modern medical practices by ancient Indian pioneers, Ayurveda, and the medicinal properties of some everyday plants. All three workshops interested the participants immensely and opened their eyes and minds to new concepts and thinking. Each workshop included an interactive presentation by a counselor followed by a team activity based on the theme. 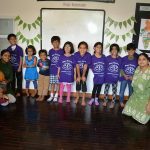 Sri Poornimaji also took an active role in the presentations by explaining details and answering the children’s queries, and her presence made a huge difference to the camp. The participants found the sessions on Science & Technology and Ayurveda very informative and appreciated the greatness of India’s ancient heritage. The session on Past Life and Rebirth completely blew the children away! This was the first time that most of the participants were being exposed to such a detailed discussion on the subject, and they found the subject extremely fascinating and intriguing. The fact that western science was also stumbling upon and finding irrefutable evidence of reincarnation was something that hugely provoked the children’s interest. At the end of the second day, there was a prolonged Q & A session with Sri Poornimaji. The children’s questions were all profound and well thought-out, and Poornimaji answered them all patiently and in great detail. 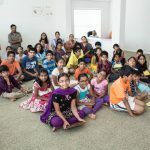 Apart from the Traditional Treasures workshops, the camp also included Tri-Yoga for the body, mind and soul through physical yoga, shravana yoga (active listening sessions to sharpen the mind), and Nama meditation, and other games like Treasure Hunt, etc. 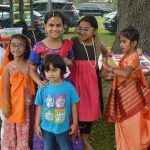 15 children participated in the camp that was held in Houston Namadwaar.